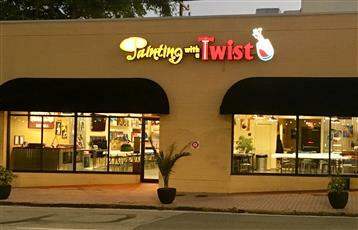 Here at Painting With A Twist, Cocoa Village, we love to host private parties! Bachelorette parties, birthday parties, bridal showers, corporate & team building events, holiday celebrations, kids' parties and more! To book your party, just call the studio or fill out the form below to request a party time. We require a minimum of 20 painters on Friday & Saturday evenings, 12 all other days/evenings, and can accommodate up to 22 in our Private Room, 40 in our Main Room! Weekends book fast so get your request in soon! Have a favorite artist? Let us know and we will do our best to make sure that they work your event.